As our applications grow, we want to adopt a manageable strategy for handling errors in order to keep the user’s experience consistent and more importantly, to provide us with means to troubleshoot and fix issues that occur. Whenever an exception is thrown inside the try block, the execution continues in the catch block. The finally block executes after the try block has successfully completed. It also executes when exiting the catch block, either successfully or with an exception. The type used (Exception in our case), specifies which exceptions will be caught by the catch block (all in our case, as Exception is the base type of all exceptions). Any exceptions that are not of the given type or its descendants, will fall through. If a user selected a non-existing or invalid file, we can allow him to select a different file or cancel the action. If a network operation timed out, we can retry it or invite the user to check his network connectivity. For remaining unexpected exceptions, e.g. a NullReferenceExceptions caused by a bug in the code, we can show the user a generic error message, giving him an option to report the error, or log the error automatically without user intervention. Doing this is bad for both the user and the developer. The user might incorrectly assume that an action succeeded, where infact it silently failed or did not complete; whereas the developer will not get any information about the exception, unaware that he might need to fix something in the application. Hiding errors silently is only appropriate in very specific scenarios, for example to catch exceptions thrown when attempting to log an error in the handler, for unexpected exceptions. Even if we attempted to log this new error or retried logging the original error, there is a high probability that it would still fail. Silently aborting is very likely the lesser evil in this case. This is often appropriate for exceptions which you can handle programmatically, without any user interaction. This is in cases when your application can fully recover from the exception and still successfully complete the requested operation, and therefore the user does not need to know that the exception occurred at all. However, if the requested action failed because of the exception, the user needs to know about it. GetPersonEntity will catch the exception and show an error dialog to the user. Because of the previous failure, ApplyChanges will fail to update the PersonEntity with the value of null, as returned by the first function. According to the policy of handling the exception where it happens, it will show a second error dialog to the user. Similarly, Save will also fail because of PersonEntity having null value, and will show a third error dialog in a row. To avoid such situations, you should only handle unrecoverable exceptions and show error dialogs in functions directly invoked by a user action. In contrast, UpdatePersonEntity and any other functions called by it should not catch any exceptions that they cannot handle properly. The exception will then bubble up to the event handler, which will show only one error dialog to the user. This also works well in a web application. In an MVC application, for example, the only functions directly invoked by the user are action methods in controllers. In response to unhandled exceptions, these methods can redirect the user to an error page instead of the regular one. To make the process of catching unhandled exceptions in entry functions simpler, .NET framework provides means for global exception handling. Although the details depend on the type of the application (desktop, web), the global exception handler is always called after the exception bubbles up from the outermost function as the last chance, to prevent the application from crashing. What exactly should a global exception handler do? Calling ToString() on an exception will return all its details, including the description and call stack in a text format. This is the minimum amount of information you want to log. To make later analysis easier, you can include additional information, such as current time and any other useful information. Where should the files be located? Most applications do not have administrative privileges, therefore they cannot write to the installation directory. How to organize the log files? The application can log everything to a single log file, or use multiple log files based on date, origin of the error or some other criteria. How large may the log files grow? Your application log files should not occupy too much disk space. You should delete old log files based on their age or total log file size. Will the application write errors from multiple threads? Only one thread can access a file at a time. Multiple threads will need to synchronize access to the file or use separate files. 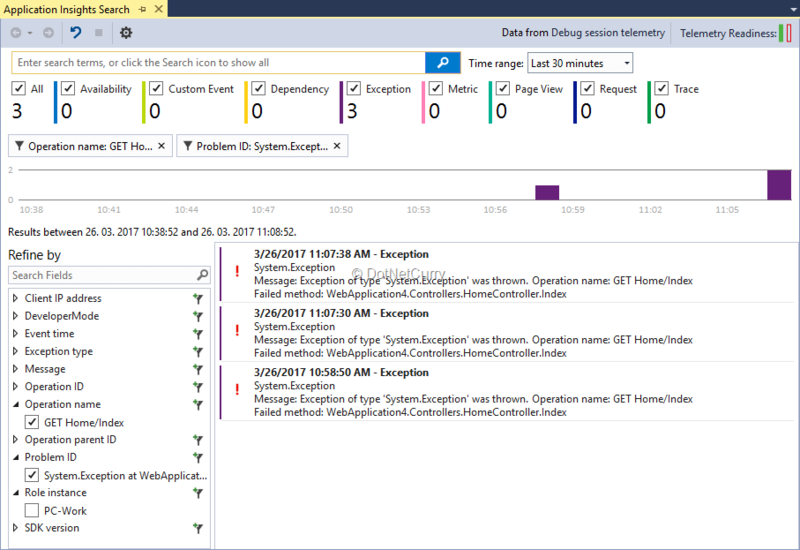 Windows Event Log was designed for logging errors and other information from applications. It solves all of the above challenges, but requires dedicated tooling for accessing the log entries. If your application already uses a database, it could also write error logs to the database. If the error is caused by the database that’s not accessible, the application will not be able to log that error to the database though. You might not want to decide on the above choices in advance, but rather configure the behavior during the installation process. Supporting all of that is not a trivial job. Fortunately, this is a common requirement for many applications. Several dedicated libraries support all of the above and much more. For .NET framework, the most popular logging libraries are probably log4net and NLog. Although, there are of course differences between the two, the main concepts are quite similar. The above configuration specifies that all errors will be logged to the errors.log file and accompanied with a timestamp. However, you can easily specify a different type of target instead of a file or even add additional targets to log the errors to multiple locations. With the layout attribute, you define which additional metadata you want to log along with the message. Different targets have different additional attributes to further control the logging process, e.g. archiving policy for log files and naming based on current date or other properties. Using the rules section, you can even configure logging of different errors to different targets, based on the name of the logger that was used to emit the error. Log levels can add additional flexibility to your logging. Instead of only logging errors, you can log other information at different levels (warning, information, trace…) and use the minlevel attribute to specify which levels of log messages to write to the log and which to ignore. You can log less information most of the time and selectively log more when troubleshooting a specific issue. 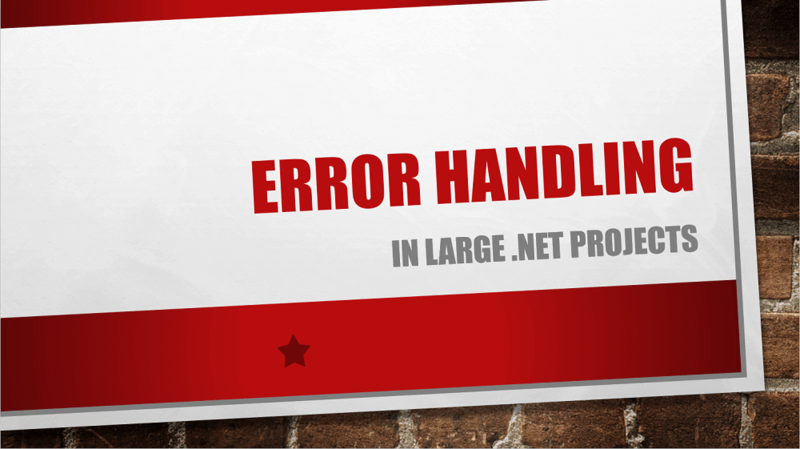 Editorial Note: If you are doing error handling in ASP.NET applications, check out Elmah. Logging information about errors is only the first step. Based on the logged information, we want to be able to detect any problems with the application and act on them, i.e. fix them to ensure that the application runs without errors in the future. Receive notifications when errors happen, so that we do not need to check all the log files manually. If errors are exceptional events, there is a high probability that we will not check the logs daily and will therefore not notice the errors as soon as we could. Aggregate similar errors in groups, so that we do not need to check each one of them individually. This becomes useful when a specific error starts occurring frequently and we have not fixed it yet since it can prevent us from missing a different error among all the similar ones. As always, there are ready-made solutions for these problems available so that we do not need to develop them ourselves. A common choice in .NET ecosystem is Application Insights. It is an Azure SaaS (Software as a Service) offering, with a free tier to get us started, and a usage based pricing model. The product is tightly integrated into Visual Studio. There is a wizard available to add Application Insights telemetry to an existing project or to a newly created one. It will install the required NuGet package, create an accompanying resource in Azure and link the project to it with configuration entries. This is enough for the application to send exception data to Application Insights. By adding custom code, more data can be sent to it. There is even an NLog custom target available for writing the logs to Application Insights. Logged data can be analyzed in Azure Portal or inside Visual Studio. If you want or are required to keep all the information on-premise, there is an open source alternative available: OneTrueError. Before you can start using it, you first need to install the server application on your own machine. - Install the NuGet package for your project type, e.g. OneTrueError.Client.AspNet for ASP.NET applications. As with Application Insights, you can send more telemetry information to OneTrueError with custom logging code. You can inspect the logged information using the web application on your server. Both Application Insights and OneTrueError, as well as other competitive products, solve another problem with log files: large modern applications which consist of multiple services (application server, web server, etc. ), and are installed on multiple machines for reliability and load balancing. Each service on each machine creates its own log and to get the full picture, data from all these logs needs to be consolidated in a single place. By logging to a centralized server, all logs will automatically be collected there with information about its origin. Until now, we focused on server side applications and partially desktop applications, however mobile applications are becoming an increasingly important part of a complete software product. There is no way to easily retrieve data stored on mobile devices, not even in a corporate environment. The application needs to send the logs to a centralized location itself. You cannot count on mobile devices being always connected; therefore, the application cannot reliably report errors to a server as they happen. It needs to also store them locally and send them later when connectivity is restored. Just like Application Insights and OneTrueError provide a complete solution for server application, there are dedicated products available for mobile applications. Typically, they are not limited to error or crash reporting but also include support for usage metrics and (beta) application distribution. Microsoft’s companion to Application Insights for mobile and desktop applications is HockeyApp, but there are other alternatives available, such as Raygun and Crashlytics. They have similar feature set and mostly differentiate themselves by varying support for specific development platforms and pricing models. Most of them require only a couple of lines of code to get started. Error handling is a broad topic, but also a very important part of application development. The actual project requirements will depend on various factors such as application size, deployment model, available budget, planned lifetime and others. Nevertheless, it is a good idea to devise an error handling strategy for a project sooner rather than later. It will be easier to implement and will provide results sooner.